Saturday afternoon in the north-eastern India city of Guwahati saw 160 names from 31 countries go into the draw for the 2017 AIBA Women’s Youth World Boxing Championships, with all boxers born in 1999 or 2000. The week-long tournament, running from 19-26 November, not only provides the springboard to the Elite level and the exciting prospect of inclusion on the Tokyo 2020 Olympic Cycle, but a handful of quota places for next year’s Youth Olympic Games in Buenos Aires. The prospect of Olympic contention sees the greatest number of boxers entering into the Flyweight (51kg) class with 25 boxers in the draw, while 22 will compete for glory at Featherweight (57kg) and Lightweight (60kg). The teams with the largest delegations in India are India, Kazakhstan, Russia and Ukraine, all with the maximum 10 boxers competing, while Australia, Ireland, Turkey and United States of America have all sent large squads to Guwahati. The Nepal and Kosovo teams will make their Youth World Championship debuts. At Light Flyweight (48kg), Bulgaria’s three-time EUBC European Champion Emi-Mari Todorova will face Australian newcomer Danielle Clayton in the first preliminary round. Should Todorova make it through, her last-16 bout will be a hotly anticipated contest against the host nation’s top boxer, Nitu. Shylah Waikai has been training in Australia but boxes for New Zealand in Guwahati, and the talented 17-year-old’s first opponent in the Flyweight (51kg) competition will be Australian Indianna Heibloem. At Bantamweight (54kg), India’s AIBA Junior World Champion Sakshi Choudhary is among the favourites, but a tough opener comes in the form of Russia’s two-time EUBC European Champion Indira Shudabaeva. The opening rounds at the weight class will also see an intriguing battle between United States’ top hope Isamary Aquino and Ukraine’s EUBC European Women’s Junior Champion Kateryna Rohova. Among the favourites at Lightweight (60kg) are United States’ most experienced youth boxer Diana Estrada, France’s EUBC European Women’s Youth Champion Fatia Benmessahel, Kosovo’s AIBA Women’s Junior World Boxing Championships silver medallist Donjeta Sadiku and Australia’s Commonwealth Youth Games winner Ella Boot, all of whom find themselves in the top half of the draw. At Welterweight (69kg), Kazakhstan’s AIBA Women’s Junior World Champion Nadezhda Ryabets has fully recovered from injury and will begin her title challenge against United States’ National Youth Champion Citlalli Ortiz. Russia’s strongest boxer Anastasia Shamonova has been unstoppable in recent years, but the AIBA Junior World Champion, EUBC European Women’s Youth Champion and two-time EUBC European Women’s Junior Champion meets a top opponent in her first bout at Middleweight (75kg); United States’ Sharahya-Taina Moreu. Another member of the strong Russian team, Kristina Tkacheva, has won three European titles in recent years and was crowned AIBA Junior World Champion in 2015, but she suffered a surprise defeat at the hands of Ukraine’s Maria Lovchinska in the quarter-finals of the Ahmet Comert Youth Tournament last month. The two talented boxers will now meet again in the first round of the Heavyweight (+81kg) competition for a place in the last four against Turkey’s Sueda Sahin. 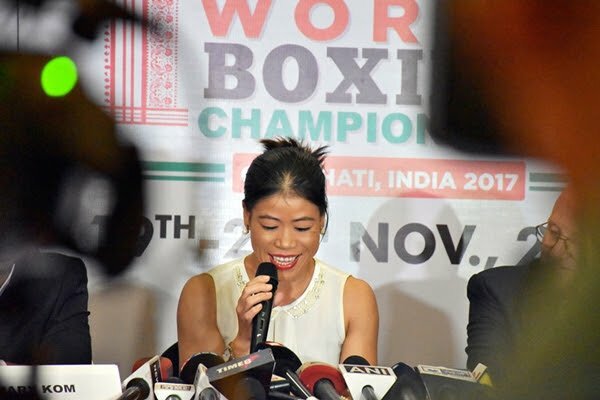 The Official Draw was followed by the opening press conference that included the presence of Tournament Ambassador and Indian boxing legend Mary Kom. The Flyweights will get the 2017 AIBA Youth Women’s World Championships up and running on Sunday at 2pm local time. Daily schedule and draws are available here.